The morning greeted us with a radiant sun rising up over the high Sierras, its rays cutting through the perfect blue sky and shining strong, reminding us that although fall was only a couple of weeks away, its summer warmth was still in store for the day. 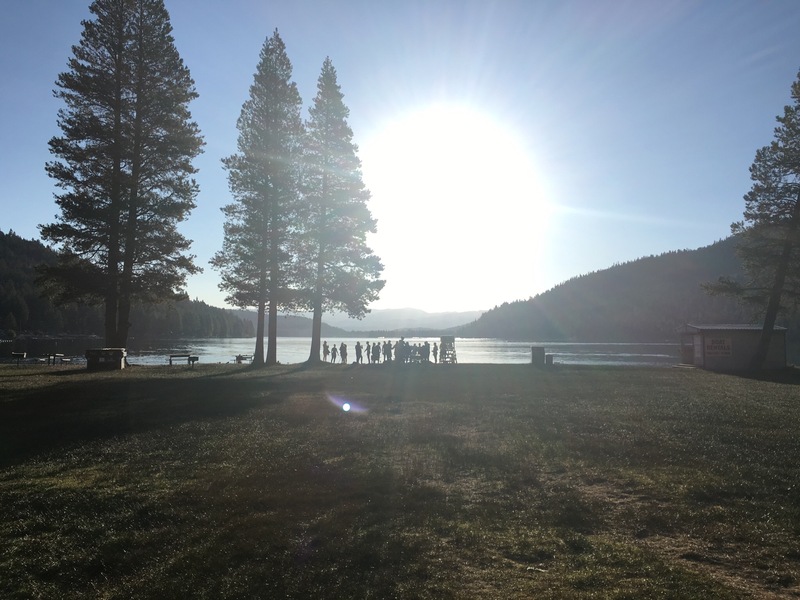 The swimmers gathered on the shores of Donner, surveying the water, like a sheet of glass stretching almost three miles across the length of the lake. 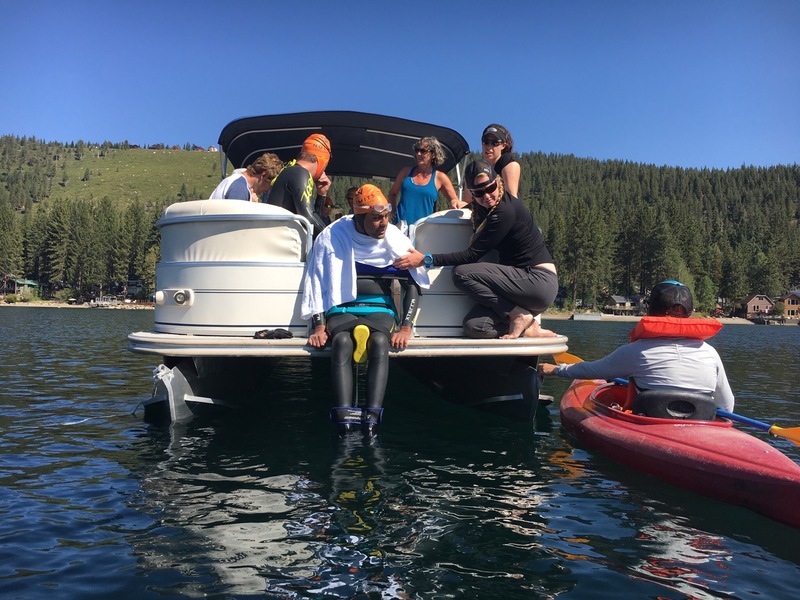 Some, like me, had trained for this day for months, convincing themselves that the frigid water and the 6,000 feet of altitude wouldn’t get the better of them in their attempt to push their limits and accomplish what had seemed previously unfathomable. 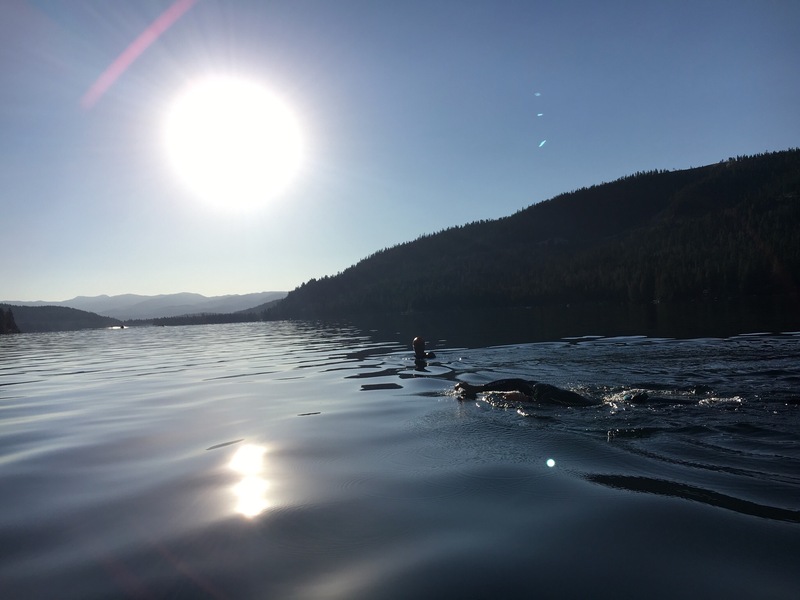 Others had decided that they would get into the swimming spirit in any way, shape, or form and be out in the open water, itself a significant challenge and accomplishment. And finally, there were all of the friends and family who would cheer and support from a kayak, paddle board or from the dry, rocky, tree lined shore. I had been worried that the powerful and relentless winds and waves that Brita and I had swam through when we had trained here a month earlier would challenge all of us and make this feat harder, possibly even impossible for me, but thankfully Mother Nature decided to prove me wrong. The winds were pleasantly absent, the water was refreshingly cold yet beautifully clear, and the boundless energy and positive spirit of everyone permeated through the smiles and faces of all the swimmers and supporters alike. Even the orange swim caps with our non-profit’s name and logo plastered on the side (a last minute addition to the event that arrived just in time) looked perfect countouring everyone’s heads, marking us all a part of this magical experience which had all started as a crazy idea in my head nine months earlier. Quick break to refuel and warm up!